Middle age hit me hard–so I hit back. I threw money at everything, but nothing really seemed to make a difference, until I tried Recharge. The first thing you notice are the intense dreams. For me, this was really important, because I’ve been an intense dreamer all my life. But as I got older, my sleep quality started to degrade, as did the frequency of my dream sleep. From the first night, Recharge brought back my intense night dreams, and I was definitely sleeping better. My mental clarity and focus have also benefited: I’ve been writing a book since January. Before Recharge, I had trouble getting on task. After a month of taking it, I was writing regularly every day. No procrastinating, just efficient work. 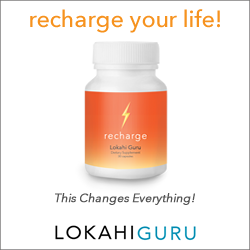 Physically, the effects of Recharge are most noticeable on my energy and stamina. I spent two weeks in Hawaii this spring. 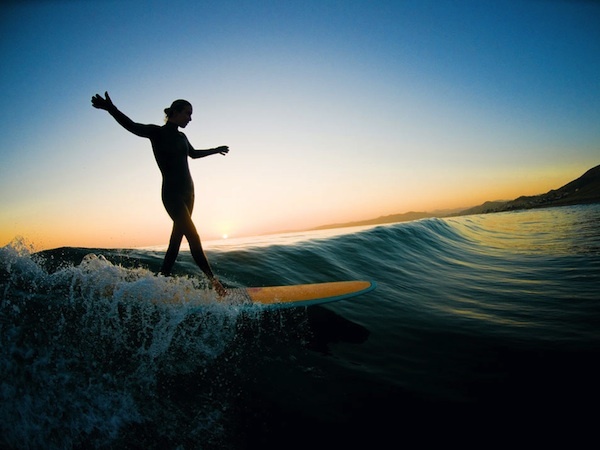 Basically, I would surf for two days, scuba dive for another two days, then repeat that cycle. If you’ve tried either sport, you know how tiring they can be. But I was up at the crack of dawn every morning for two weeks to beat everyone to the water. No soreness. No lethargy. No after-exercise hangover. None of my teenagers could keep up with my 48-year-old Recharged self. Last, but definitely not least: Recharge makes you look fantastic. It’s like a facelift in a bottle. No surprise: If you are sleeping great, and you have the energy to do things that make you happy, of course you’ll look great as well. On Facebook, my friends often post #TBT (or throwback Thursday) pictures from the 1980s before time took its toll. 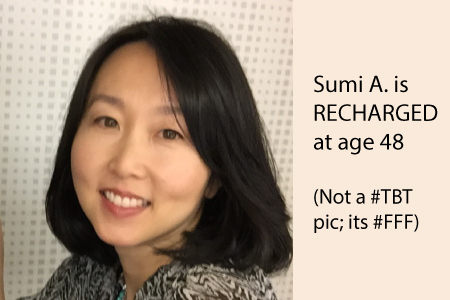 For people like Sumi and other users of RECHARGE, we should show our current faces. Maybe we can start a #FFF (face forward Fridays) meme for people who are actually looking, feeling, and performing younger every day? When you think about it, you have a 100% chance of feeling older and getting sicker if you do nothing. Why not take an asymmetric risk and try RECHARGE? You can always keep a bottle of RECHARGE in your medicine cabinet for recovery from a stressful day or demanding workout even if you don’t think you can justify long term use. But if you are able to continue, even better. Sumi’s transformation has only taken 3 months and users of adaptogens often cite that the second year is better than the first.